One of the biggest struggles in healthy eating is often what to eat for lunch. Yeah, there are tons of recipes out there for dinner. Breakfast can be anything from an egg to a protein bar to an easy yogurt parfait. But what’s an easy and healthy lunch that can be taken to work, school, or on-the-go? 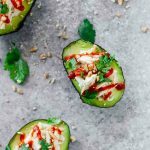 This Healthy Sriracha Tuna Stuffed Avocado recipe is solving healthy lunch probs while simultaneously making the world a better place with it’s savory, spicy, and delicious flavors! This is a sponsored post written by me on behalf of Bumble Bee® Seafoods, but my love for their amazing products is completely my own! I know I say this a lot, but this is seriously one of my fave recipes right now. Ok, they’re all my fave, I know I know….but GUYS. There’s something about this one! Maybe it’s my avocado obsession. Creamy, savory, wholesome. Maybe it’s that in-your-face-spicy-but-not-too-spicy Sriracha thing. GIMME ALL THE SRIRACHA ON EVERYTHING. Maybe it’s that fresh-tasting, wild-caught Bumble Bee® Solid White Albacore Tuna that I used in this recipe! It’s been a minute since I’ve had tuna for lunch, but my life may have been recently changed for the better after this Healthy Sriracha Tuna Stuffed Avocado recipe loaded with Bumble Bee® Solid White Albacore Tuna. I mean, why did I ever stop? Nobody knows, but I do know how incredibly delicious it is in this recipe and how it takes it to another level! It’s so easy to take on-the-go (just pack it up with an avocado, a bottle of Sriracha, and the optional cilantro/pecans for this recipe), it adds amazing nutrients like healthy fats and lean protein (see bumblebee.com for full nutritional facts), and it’s made with sea salt (ALSO Non GMO….the BEST). Bumble Bee® Solid White Albacore Tuna differs from Chunk Light Tuna in that it has a solid, firm, steaky texture and (in my opinion) a lighter, fresher taste. If you’re looking for a great way to add protein to your everyday, on-the-go lunches, be sure to check out Bumble Bee® Solid White Albacore Tuna and discover why Only Bumble Bee® Albacore Will Do™! The end! So easy, right? Like the easiest EVER. I’ve added a recipe below to make it all “official”, but it hardly even needs one. This Healthy Sriracha Tuna Stuffed Avocado situation only takes a couple of minutes to put together and, if we’re being honest, only took me a few minutes to devour. 😉 Enjoy, friend! Cut avocados in half. Remove seeds. Fill each avocado half with tuna. Top with Sriracha, cilantro, and pecans. Enjoy! Each serving is 2 avocado halves.